It’s been a while since I did a perfume review. It’s crazy, I wear perfume every, single, day but somehow, for whatever reason, I’d never say I was/am big on it. I do love the idea of having a scent… that smell that rewinds people deep in nostalgia. A flashback, a memory, a unique moment, one person! Yeah, I love that. It’s that kind of reminiscent feeling that I want to leave people with when they catch my scent. But let’s be real, there are far too many options out there for me to tie myself to that one singular smell, right? Taiwo pretty much swears by the Cartier La Panthère so I thought it would be good to pick up on my perfume blogging here. She’s been wearing it for about 3 – 4 weeks now and can’t seem to put it aside, so she recommended I wear it. After all, the scent is not just a smell, “It’s an experience”. So, I put down my current favourite, Dior’s Joy (Leah, you did this to me) and went with one spritz of La Panthère. Because from the first whiff I could tell that anything more would probably have been overpowering. I’m going to skip the packaging because there’s nothing particularly beguiling about it. A bit of a letdown really as the bottle, although very boxy and quite masculine in appearance, harbours the mask of a well chiseled Panther. It’s like a buried secret only exposed in temperate lighting, at an undefined angle. The scent is mature, musky, with a wood-like undertone…. It can’t be bullied…. It’s powerful! It smells like a CEO, DOMINANT. Dissecting the smell now, I can see why Taiwo likes it. It reveals everything about her argumentative side – the side I debated with at about 12:20am on White Supremacy but let’s not get into that – It’s definitely not my scent but like I said, I see why she likes it. It smells expensive… Like a lifestyle! YouTube has been intermittently schooling me on photography over the past couple of weeks or thereabout. So, at about 1:00am, I pulled out my DSLR and thought it would be a great time to put my skills (and new-found knowledge) to the test. How did I do? Have you tried Cartier’s La Panthère? Any thoughts? I think I’m a little late to the party. I missed the Oscars. Not intentionally….. not unintentionally either. My interests snoozed comfortably round the spectrum of indifference. I’m not bummed about missing it, like I said, I’m just “a little late to the party”. And not late in the cool, “fashionably late” kinda way…. the Nigerian kinda late when you miss the whole damn thing… and then some! 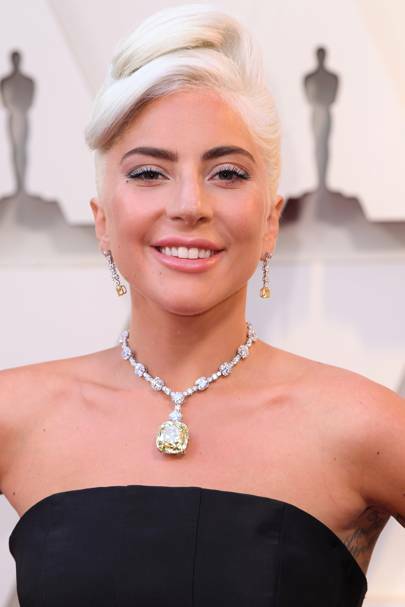 At some point over the past week, Sky News showed their typical 30 second or so entertainment news highlight/s and I came across Lady GaGa’s Oscars outfit. I haven’t had an “OH MY GOD!” moment in a long time, particularly concerning the red carpet, but this…..! This was definitely one! Black dresses are always a classic but the contrast against The GaGa’s [monotone] pale skin and bleached blonde hair was ordained by the fashion gods. The exaggerated hips were an instant reflection of McQueen’s quirkiness and the pleated skirt that expanded to floor length was breath taking, but the opera gloves and Tiffany’s necklace screamed classic Hepburn from about a mile and a half off. We all know nothing screams classy like Audrey. Now that we’ve got that dress out of the way, let’s take a minute to appreciate that necklace shall we? The rock sized canary yellow gem, supported by “miniature” white gems delicately laid between both of Lady GaGa’s collar bones and had my jaw on the floor for the best part of the next 5 mins. I don’t think I’ve ever seen a rock that big, I don’t think I’ve ever seen a rock that worthy! It was breathtaking, spectacular, literally jaw dropping. It just dazzles! You don’t wear a necklace like that then decide to show off beach waves or silky straight hair do you? It’s got to be an up do… you know… to show off the master piece. Oh and as for the make up, gotta keep it natural looking and simple. The Oscars is no carnival! Since I saw the Gaga’s outfit, I haven’t bothered googling any other star’s outfit. It would be unjust! Ps: I’ve been lusting over a yellow dress very much like Andie Anderson’s on How to Lose a guy. But the price… my goodness the price! PPs: Why was Andie carrying that horrible bag? Author Bonita ValliPosted on March 16, 2019 March 16, 2019 Categories Designers, Style, Red CarpetTags Alexander McQueen, Harry Winston, How To Lose a Guy in 10 Days, Isadora, Lady GaGa, Red Carpet, Tiffany'sLeave a comment on Ladies…Frrrrost Yourselves! [Un]Popular Opinion: cliché as it may sound, I think Pablo Picasso is a friggn LEGEND! And while we’re at it…. Cubism is in fact my favourite Art Movement. Jacquemus is a young, talented, French, modern designer. His take on fashion is almost architectural in execution. He deconstructs objects, rebuilding sculpted masterpieces. Jacquemus footwear was launched two years ago. His creative ingenuity in my opinion, borders on modern day Cubism. 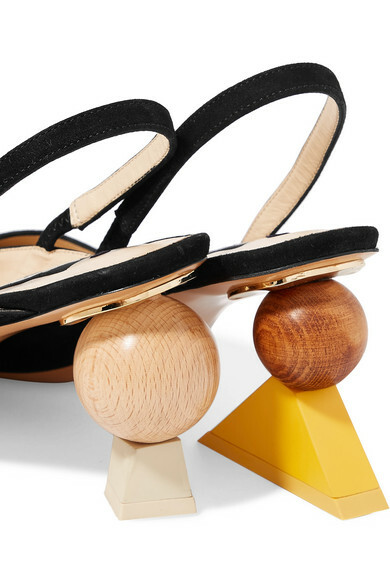 He leverages basic shapes and cleverly balances them to curate whimsical shoe perfection. You see, the thing I love about Cubism is its ability to produce a conceptual image as opposed to the perceptual form. After all, I consider vision to be reassembled shapes built up to create depth and manipulated in form. Jacquemus is only 29 and already pushing fashion boundaries. It’s a shame he’s put a stop to his quirky shoes. Regardless, I’m curious as to what he will unfold as he continues to rebuild, reinvent and rediscover. Who’s your designer of the moment? What’s your favorite Art Movement? PPs: I’ve had my Nikon D3100 for 8years and only just decided to properly learn photography. So far, so fun! Since the start of the year, I’ve put zero effort into my physical appearance. Make-Up routines have become a distant memory, my heels have accumulated dust of varying degrees and my hair has been somewhat neglected, neatly hidden between braids or Senegalese twists. Between my Mum, Wura and Gbonju, I experienced an unsequenced, well articulated ‘intervention’. I didn’t make any promises, but I did resolve to ‘do better’ more consistently. Heels would ordinarily have been my first step towards my ‘come back’ but given that I walk up four flights of stairs every morning, I passed on that struggle (thank you very much)! The other option was Make-Up. My Make-Up is pretty basic, so this shouldn’t be much of a problem, right? Wrong! My biggest issue has been an oil defying, sweat resistant (I’m actually not kidding) PRIMER. At the end of every day, I find that a considerable amount of my oily skin disintegrates my LA Girl HD, boils through my MAC NW45 and my Make-Up in general starts to slip right off my face. Once or twice, I’ve tried to psyche myself into thinking it’s a ‘dewy look’ but it’s not. Ladies, I need your help! Any suggestions? Maybe I should take this to the Insta-polls…? Meanwhile, I think this has been one of my best Make-Up looks all YEAR…. AND it’s a picture of myself that I actually like, so I’m just going to drop. this. right. here. Pps: What do you think of the heading ‘Plastic’? I kinda like it.